Welcome! Today, I am very enthusiastic to tell you all about my first-hand encounter with the Hands-Free Phone Magnets that we sell on the DroverShop. Moreover, we require that all Drover drivers use at least one of these hands-free phone magnets for optimum safety while completing rides. These magnets are available in three styles -- fixed, pivoting, and 360-degree rotation. 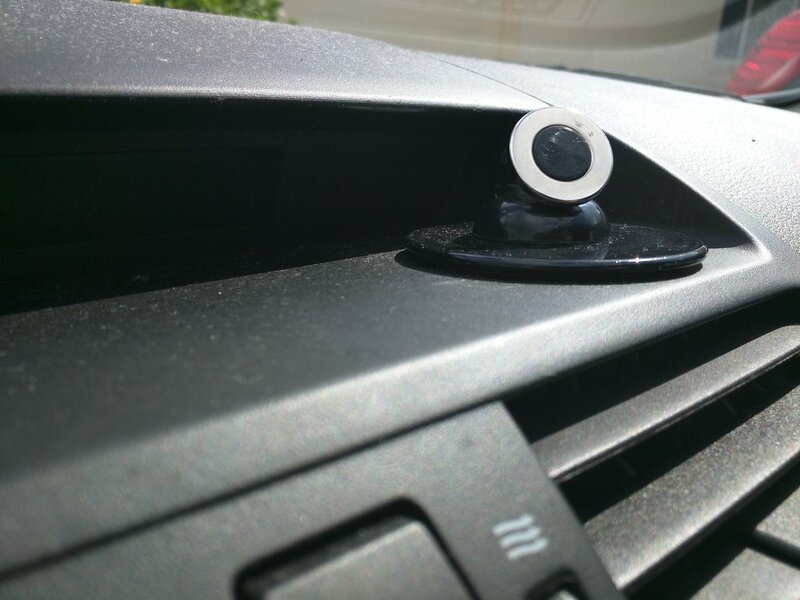 The fixed and pivoting magnets mount to your car's air vents using a padded claw (so as to not scratch the soft plastic air vents) while the 360-degree magnet is an adhesive that can be permanently affixed to pretty much anywhere in your car, even the windshield. In this blog, I will provide videos and pictures of these magnets in use in our Mazda 6 to show you how these high-quality, powerful magnets will function inside your car. Remember that having a hands-free phone mount can make driving safer for anyone, so even if you aren't a rideshare driver, consider purchasing one from the DroverShop. The fixed, air vent mounting magnet is perhaps the most basic and non-intrusive magnet we have. It does not require adhesive -- to either your phone or your car -- and mounts to your air vent using padded claws to protect the plastic from scratches. This is the magnet for the driver who wishes to be able to quickly remove it from the dashboard and pretend it was never there. But it was there. You loved using it. Admit it. Now, keep in mind that in these videos and pictures, I am using the Google Nexus 6, which is one of the heaviest and largest phones available, with a 6" screen, larger than that of the iPhone 6+. On top of its natural size, I use a case. The fixed, air vent mounting magnet is very strong, such that if you have a caseless phone made of a magnetized metal, it will probably hold your phone without anything else added into the equation. My phone, without its case, with the supplied metallic plate simply placed (not glued) on the back of my phone, ready for the case to be snapped on again. If your phone does have a case, like mine does, this magnet (as well as the pivoting model) comes with two magnetized plates, one rectangular and one circular, that you can place inside your case to make it magnetic from the inside. I had to do this with my phone because my case was too thick for the magnet to hold my phone without the plate. The side of the plate that you can't see, pressed against my phone, is covered in a thin layer of felt so as to not scratch the surface of the phone. **All of what I have described, the metallic plates with felt, etc, are included with your purchase of a Drover air vent mounting magnet. This plate is very magnetic and the magnet will really hold it well once its inside your case. By placing in between your phone and case, you have effectively made your phone magnetic! The plate is really thin and non-intrusive. Also, my phone body is even curved a little bit (it's a Motorola thing) and the plate was fine. Just a quick cautionary note -- if your phone case is so thick that you think the magnet will not be able to hold it even with the metal plate inside, consider the adhesive magnet described as the third magnet in this post. This magnet has adhesives to both the car and your phone that will create a stronger hold for heavier phones and/or with large, thick cases. The biggest pro of this magnet is that nothing has to be permanently attached to your car or phone. Potential downsides can include your air vents pointing downwards from the weight of the phone and the flow of your air being interrupted by the presence of the phone. For the sake of clarity neither of these two conditions would persist once you remove the phone, obviously. The Fixed, Air Vent Mounting Drover Magnet... Available at DroverShop Here. The Pivoting, Air Vent Mounting Magnet at DroverShop is very similar to the Fixed model, except the triangular metal plate can rotate in 360-degress and also move up/down/left/right via a ball joint connected at the base before the padded claw. Again, it comes with padded claws to protect the plastic of your air vents, as well as the two metallic plate to accommodate cases. An important note to consider about this magnet is that it protrudes outward more from the air vent than the fixed model due to the ball joint mechanism. Aesthetically, this could be a downside for you, or it could be extremely welcomed if you needed your phone an extra half-inch closer for the aux cord to reach. Moreover, it has the added benefit to the fixed magnet of being able to pivot in different directions, if this is useful to you. The adhesive, rotating magnet is really a different type entirely from the other two above. When I first took it out of the box, it honestly took a few minutes to process what I was looking at (I don't read manuals if I can avoid it). I did eventually, however, and what I found was the most powerful magnet we sell. Let me walk you through how it works. First off, the large, black plastic circular plate does not come with the magnet. That is a space Mazda builds into their base model dashboards specifically designed for mounting adhesives. What you will receive is a black, plastic half-sphere, which you can see stuck to the Mazda's black plastic plate. The black half-sphere comes attached to a silver, metallic sphere. Together, they look like a metal ball on a round pedestal/holder. The metal ring with the black inner circle visible in the picture to the right is actually a separate piece that attaches to the previously mentioned piece. Finally, you will receive a small, thin chrome metal plate that affixes to the outside of your phone/case via an adhesive. This option is for very heavy phones made of non-metallic materials, or phones with large, thick cases. I *think* that the magnetic sphere combined with the metal ring (as pictured) is strong enough to hold a newer iPhone without actually sticking the partner metal plate to your phone as described above. I cannot confirm this, however, since I have not tried it with an iPhone. For this mount, I used my mom's Nexus 6, which has an even bigger and heavier case than mine. It is probably the penultimate example of a large phone with a large case. In the below picture, you can see the small metallic plate that is actually stuck/glued to my mom's phone right now. It is not horribly intrusive, but definitely not as aesthetically pleasing as the previous two mounts discussed. Yet, this allows such a heavy phone to be mounted to the dash. Also, I was pretty conservative (since the Mazda is my Mom's car) in placing the magnet (since it is adhesive), but hypothetically you could even mount it to your window if you wanted. This is not the model for the minimalist, yet it gets the job done for those with a larger phone or those who do not want to mount their phone to their air vents for concern of interrupting the air flow or the vents pointing downward from the weight of the phone. I almost want to take back what I said about the minimalist, because if you do have a caseless, newer iPhone, this mount can create a beautiful result. However, if you use any case, to use this mount you will have to stick that small, round, magnetized metal plate onto it, as shown on my mom's white phone case in the picture to the right. Case with necessary circular magnetized plate affixed.